Taylor Tashima serves the ball. 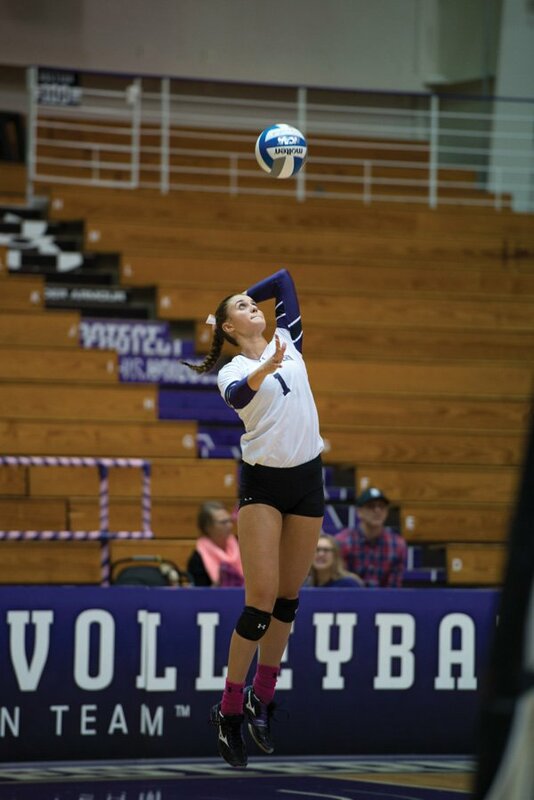 The senior setter tallied 29 assists in Northwestern’s loss to No. 13 Purdue. After a promising nonconference season, hopes were higher than usual for Northwestern heading into Wednesday’s match at No. 13 Purdue. Those hopes, however, were tempered following a comfortable 3-0 loss to the Boilermakers. The Wildcats, while disappointed with the result, were not discouraged by the 25-18, 25-20, 25-18 Purdue victory. NU (10-3, 0-1 Big Ten) struggled to stop Purdue outside hitter Danielle Cuttino throughout the night, but Cuttino finished with 16 kills on an impressive .345 hitting percentage. The Boilermakers (11-1, 1-0) entered the match ranked with the nation’s second-highest hitting percentage at .353, and they hit an absurd .420 in the conference opener. The Cats and Boilermakers split the opening 12 points of the first set, but a 6-0 serving run by Purdue’s Sherridan Atkinson gave the hosts a 12-6 lead. NU clawed the deficit back to 13-11, but Purdue pulled away to cruise to a 25-18 set win. Senior blocker Gabrielle Hazen and freshman outside hitter Nia Robinson led the team in kills in the first set with four apiece, and Abbott added three of her own. However, the team only hit .132 in the set. The second set was much cleaner offensively for the Cats, who hit .304 as Hazen led the way with five kills. Defensively, however, NU struggled to stop the relentless Purdue attack. The Boilermakers hit an impressive .476 in the second set, despite only two kills from Cuttino. Instead, it was Atkinson making the difference with five kills of her own to lead the hosts, and the Cats struggled to keep pace. The final set was tight throughout, as a kill by Robinson cut Purdue’s lead to 19-18 late in the set. After that, however, things went downhill as the hosts reeled off six straight points to clinch the match. Overall, Abbott led the way for the Cats with 11 kills, six of which came in the final set. Senior setter Taylor Tashima led NU in assists once again, setting up 29 of the team’s 34 kills. Despite the loss, the Cats still walked away encouraged by their performance and the progress they’ve made as a team this season.